The series begins with the execution of Gol D. Roger, a man known as the King of the Pirates. Just before his death, Roger announces that his treasure, the One Piece, will be up for the taking, causing the Great Pirate Era to begin. As a result, countless pirates set out to the Grand Line to look for the treasure. Twenty-two years have passed since Roger's execution, and Monkey D. Luffy, a young pirate inspired by his childhood idol and powerful pirate Red Haired Shanks, has since set off on a journey from the East Blue Ocean to succeed Roger and find the legendary treasure. In an attempt to organize his own crew, the Straw Hat Pirates, he befriends a swordsman named Roronoa Zoro and together, they sail off to find the One Piece. They soon meet Nami, a navigator and thief; Usopp, a sniper and a liar; and Sanji, a womanizing chef; leading to confrontations with Buggy the Clown, Captain Kuro and Don Krieg. Later, Luffy encounters Arlong, a fishman and member of the former Sun Pirates who thinks that fishmen are superior to humans. 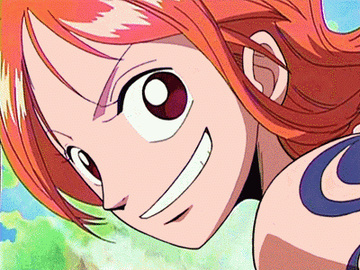 After Luffy defeats Arlong, Nami joins Luffy's crew and the Navy places a bounty on Luffy's head. After making their way through the Grand Line, the group meets Nefeltari Vivi, a princess who wants to help save her country, the Alabasta Kingdom, from the crime syndicate Baroque Works. 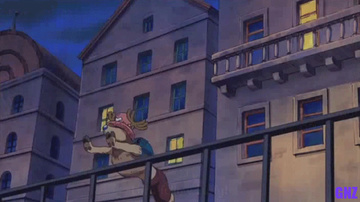 They later befriend the doctor and anthropomorphized reindeer Tony Tony Chopper while in Drum Island. The Straw Hat Pirates make their way to Alabasta, leading to battles with Baroque Works and their leader, Sir Crocodile. Luffy eventually defeats Crocodile and liberates Alabasta. 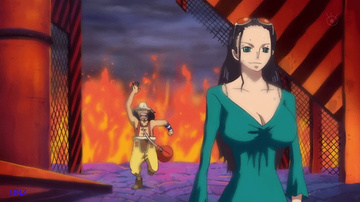 Soon after, Nico Robin, an archaeologist and former member of Baroque Works joins Luffy's crew. They soon meet Blackbeard, whose dream is also to become Pirate King. After going up to the floating island of Skypiea, the crew gets involved in a war between the Skypieans and the Shandorians, leading to a confrontation against the island's ruler Eneru, who has the power of lightning. Luffy defeats Eneru to save Skypiea and end the war. The crew soon meets the navy admiral Aokiji, who reveals that Robin was involved in searching for Poneglyphs, which are stones with markings left by an ancient civilization. The group goes to Water 7, confronting the cyborg shipwright Franky. 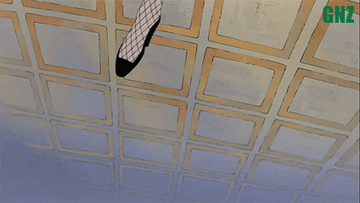 However, Cipher Pol No. 9, the World Government's intelligence agency captures Robin, and the Straw Hat Pirates team up with Franky and declare war on the World Government, resulting in battles between CP9 and its minions. The final long battle with CP9 ends when the crew saves Robin, and Franky joins their crew. Soon after, the crew helps a musician skeleton named Brook find his shadow, which has been stolen by Gecko Moriah. The crew later prepares to sail off to the New World, the second half of the Grand Line, after landing at the Sabaody Archipelago. 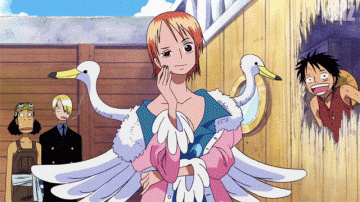 While there, they befriend Silvers Rayleigh, a former member of Roger's pirate crew who plans to coat their ship so they can travel underwater. The crew eventually gets separated during a battle with Bartholomew Kuma at the Sabaody Archipelago, with Luffy being sent to the all-female island Amazon Lily. When he learns that his older brother Portgas D. Ace has been detained at the government prison Impel Down, Luffy goes there and liberates several people from the prison, including the fishman Jimbei. Luffy soon learns that Portgas D. Ace is at Marineford to be executed. However, war breaks out between the Navy and a group of pirates led by the legendary pirate, Whitebeard. In the ensuing chaos, Whitebeard and Ace are killed. At Rayleigh's suggestion, Luffy has the Straw Hats undergo rigorous training regimens, some under the tutelage of prominent figures. Two years later, the crew regroups at Sabaody Archipelago and journeys to Fishman Island to enter the New World. During this time, a group of fishman pirates appear, seeking supremacy against humans, and hold a coup d'état to decide the fate of the island. However, after Nami forgives Jimbei for releasing Arlong into the East Blue, the Straw Hats defeat the fishmen pirates, saving the island. The Straw Hats leave Fishman Island and finally reach the New World, but not before starting a feud with one of the four strongest pirates in the New World, Big Mom. Entering the half-burning and half-freezing island, Punk Hazard, the crew encounters Trafalgar Law, and they form an alliance to take down the four strongest pirates in the New World before being drawn into a battle against Caesar Clown, who plans to use a weapon of mass destruction. After Caesar's defeat, the alliance goes to Dressrosa in an attempt to destroy the Smiles factory as the next step to take down another one of the four strongest pirates, Kaido.